Put a refreshing spin on the brown bagged lunch. Crisp lettuce leaves make a refreshing change of pace from the usual sandwich bread - wrap them around deli ham, cheese and coleslaw and enjoy! Toss 1/2 cup coleslaw blend with 1 Tbsp. Kraft Coleslaw Dressing. 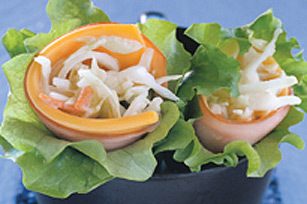 Place 3 slices (75 g) deli ham in the centre of each of 2 large lettuce leaves; top each with half of a Singles Light Slice. Cover evenly with the coleslaw mixture. Roll up. Secure with toothpicks, if desired. Substitute 2 Tbsp. Cracker Barrel Shredded Old Cheddar Cheese in each roll-up for the halved Singles Light Slice.